Ohhhhh this looks soooo good!! Going on my “fall baking” list!!! Thank you, Maria! 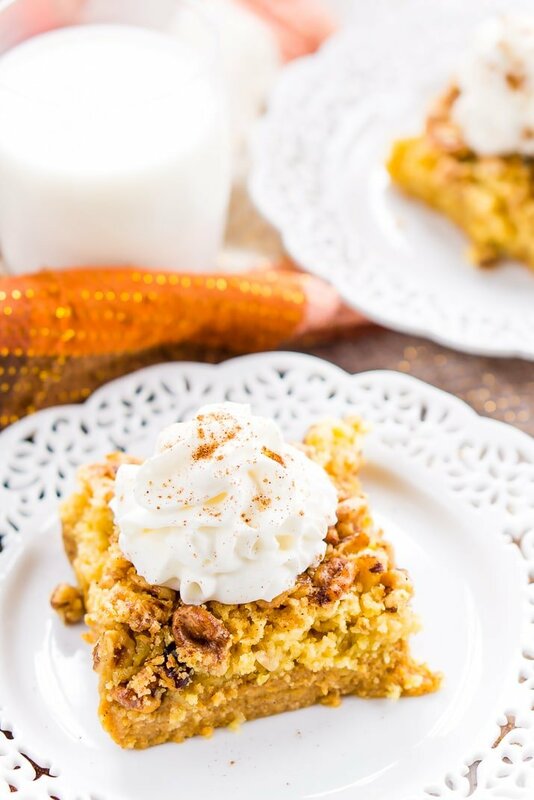 It’s a family favorite that never disappoints! Enjoy! This looks really good. Does this need to be refrigerated? We’ve never refrigerated it ourselves, but it won’t hurt if you feel more comfortable. It’s usually gone in a day or two in our house. It’s best served warm though! My family loves sweet potatoes. Going to try this recipes with those! How did you make this gluten free? Did you just use a gluten free cake mix? Yes, I used Bob’s Red Mill Gluten and Dairy Free Yellow Cake mix and you couldn’t tell the difference. Nothing else in the recipe has gluten in it. Did you make 2 of these recipes, one as written and one substituting with the gluten free product? If you didn’t do that, how would you be able to compare and state that you couldn’t tell the difference? Hi Barbara, yes, I have made this according to the recipe instructions as well as with a gluten-free cake mix instead of traditional cake mix, this is stated in the post. 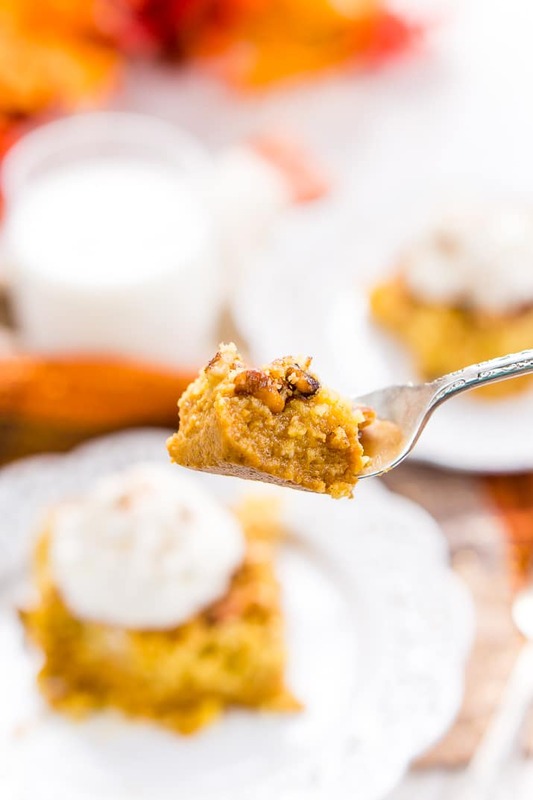 It is easy to swap out the cake mix for a gluten-free version like Bob’s Red Mill. My mother has a gluten-free diet and so I make the gluten-free version when I take this to family celebrations she will be attending. Going thru pinerest and found your recipe for Pumpkin Crumble Cake and decided to try it.Mixed it up fairy quiclky. 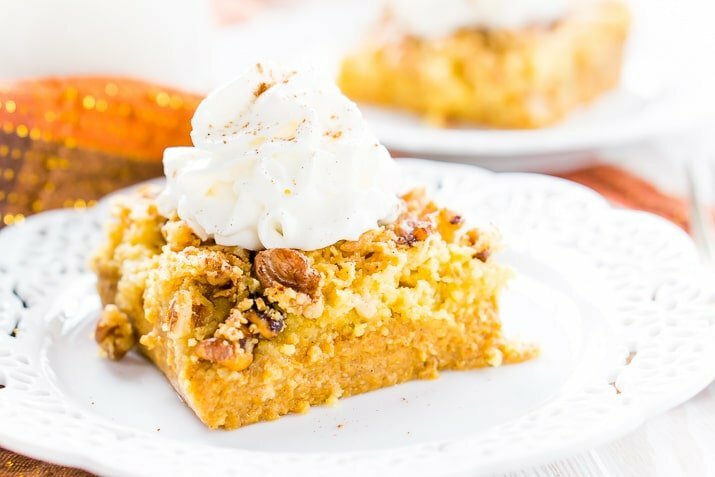 I have tried quick pumpkin cake in the past where all you add was pumpkin and not happy without doctoring it up, but I thought lets give this one a try because of all the butter. I am so glad I did. 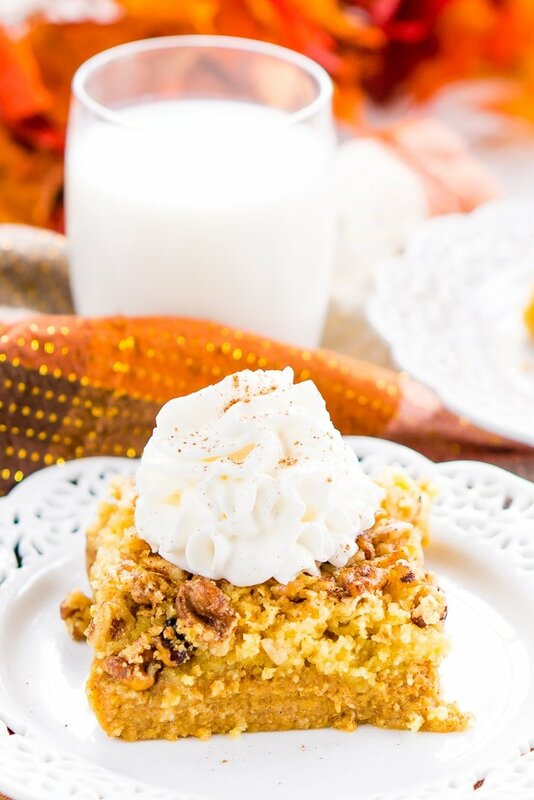 Thank you this is going to be one of my go to quick desserts because of the ease and taste. 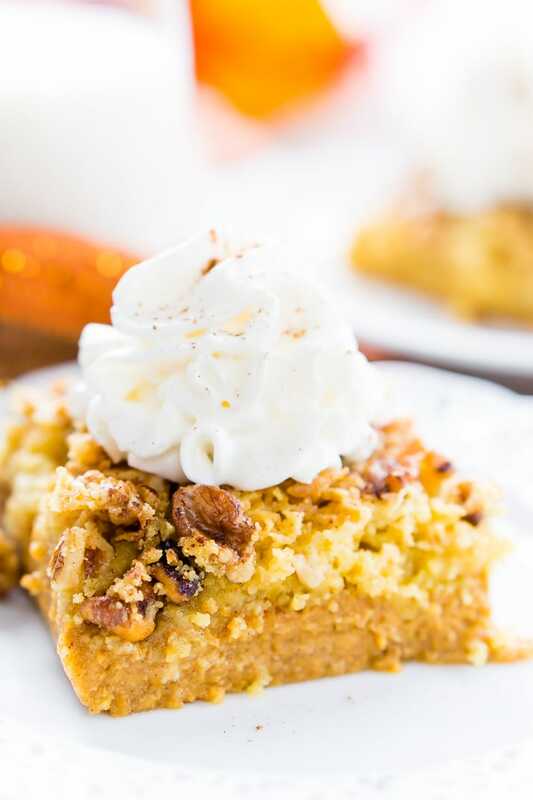 Pumpkin is our favorite all year round and now another good recipe to use. May next time try a chocolate cake mix just cause I can. I’m so glad you loved it! It’s a favorite in our house and so funny that you mentioned it because a chocolate version is on the blog menu for this fall. With chocolate chips too, of course! Hi Betty, it says 1 hour in the instructions. If you were just looking at the top time, my recipe card seemed to be having a little malfunction and only showing the prep time. It should be fixed now! It would be 100% canned pumpkin with no added ingredients.